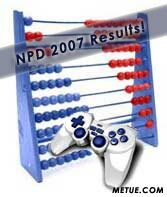 NPD December and 2007 Gaming Results: Incredible Video Game Sales. Everyone knew the numbers were going to be good; it was just a matter of how good. That and how long it would take to see them. Usually, it takes a few weeks to tabulate year end results. In that time, expectations were building. Today, NPD Group released their December and Year-End Sales results for the U.S. video game industry. The results took November’s stellar returns and raised them by one more. More records were broken. Total U.S. hardware and software sales for 2007 rose 43% over 2006 to set a new record at $17.94b. December contributed $4.82b to that tally (a 28% annual increase). In the individual categories, December hardware sales were up 17% to $1.83b. The Nintendo DS dominated with 2.47m units sold. The Wii came in second with 1.35m giving Nintendo the victory for both consoles and portables. Finishing lower, however, wasn’t without consolation prize. Month over month all the platforms performed extremely well….easily besting their prior month’s results. Both the PS3 (798k units vs 466k last month) and the Xbox 360 (1.26m vs 770k) sold extremely well. For 2007, in the hardware category, industry spending was up 54%. Nintendo’s DS and Wii again finished first and second with 8.5m and 6.29m units respectively. The Xbox was a respectable third with 4.62m units sold. The PS3, gaining with late momentum, finished in 6th but still sold 2.56m units. In software, Microsoft took the annual trophy for a single title. Halo 3, in just a few months (was released in September) proved the importance of a platform exclusive title selling 4.82m games. Nintendo had similar success with their Wii Play Remote Bundle (4.12m). Activision did extremely well with its Guitar Hero platform. The game, summed up across multiple platforms generated $820m. For software, December gross sales were in at $2.37b, up 36% year over year. Annually, software yielded $8.64b in revenue, up 34% over last year. Console games accounted for the vast majority of that ($6.64b), portable game software yielded about $2b in sales. Accessories didn’t fare badly either. Annual accessory sales totals were $2.26b, up 52% over 2006. •PS3 Product Marketing: Dear Howard, What about the Customers? How Hot is the Gaming Industry?